And if you never have, you should. These things are fun and fun is good. It seems unbelievable to me that 10 years has passed since I started playing games more regularly. I had always played games but it was mostly wargames. I was first introduced to Euros in 2004- think the first Euro I ever played was Tigris & Euphrates. Needless to say, my head almost blew off trying to understand what I was doing... it was a brave new world. Soon after I was introduced to BGG and I think I've been on the site everyday since. Think about that.. BGG has been very significant in my everyday life. I'd love to be able to play more games but I do pretty well all things considered. This list is about many of the significant games of 2004 and some of my thoughts on them. These games are 10 years old, some are still in my cross-hairs while others have fallen by the wayside. Amazing to me. Add games and your thoughts if you want! Many in my group seem to roll their eyes or 'ho hum' this one when I suggest it. Perhaps, its 10 year fatigue. But, this game does not disappoint, in my humble opinion. I remember seeing it at a store for the first time thinking- WOW, look at those yellow barrels, look at the coal, what is this about!!?? Auctions, tight money, area control, engine building. This one should still be talked about at 20! For many, this game was the gateway game into Euros. 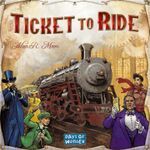 Trains are a huge sub-hobby (though, I know many will not recognize this as a true train game and I see that point) and this one has defined an age. Its fun set collection and the board looks nice as its being built. Some of the newer maps/boards are a bit more fun as they are more difficult but the original still holds a dear place. I loved this game for a brief stint- will still play it but Race for the Galaxy took its place when it came out. I don't really play either right now. But, San Juan has to be one of the most successful card versions of a board game out there. What tops it? Hard to believe this is 10 years old! I remember this coming out and being skeptical, I played it a few times and really liked it as a chess match. It didn't stick though and I sold it. Perhaps, I'll look at it again as my son gets a bit older. Anyone still play it? I like this game but certainly haven't played it as many times as others. I did play it recently, however. It is a fun game of timing and turn order, engine building and card management. I'm sure I'll play this moving forward. This game is an absolute masterpiece with 7 players; with 6 its very very good. Our group loves this game. We play it a few times a year. Can't imagine this ever changing. I remember this one b/c it was the first game I got from overseas I think... never had had an experience in buying a game direct from a company out of the US. I had heard/read all about Roads and Boats (a game I can't stand) so when this had come out I had to have it- wasn't even sure I'd like it but it seemed like a cool game. Played it a few times but just don't like it. Too fiddly? This was another game that pretzeled my head the first few times. Reese's best, perhaps? Haven't played it in ages as many in my group just don't like it- "Snooze Encounter". I'd love to play it again.